The Urban Worm Bag debuted in January 2018 as the newest version of the home continuous flow through design. Supported by a sturdy iron frame, the Urban Worm Bag is a breathable system built with 900 Denier Oxford fabric, enclosed by marine grade nylon coil zippers for easy feeeding through the top and simple harvesting through the bottom. 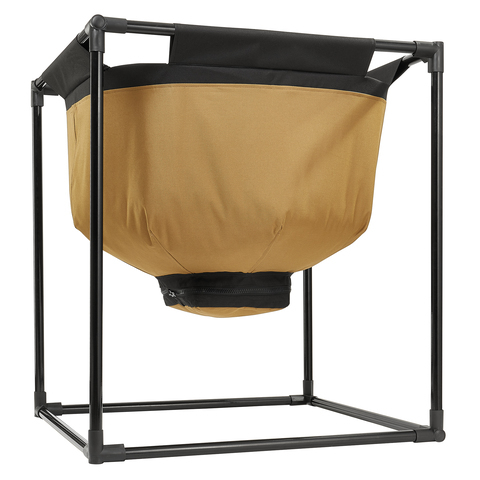 Compared to stackable tray systems like the Worm Factory 360, the Urban Worm Bag is large, capable of holding over 5 cubic feet of vermicompost within a footprint of approximately 26 inches by 26 inches with a slightly cheaper price. And compared to another home flow through called the Hungry Bin, the Urban Worm Bag is downright cheap at nearly one third of the cost. But because this system is new, I’ve been fielding plenty of questions about it, so I’m thrilled to be able to answer them here! What Are the Specs on the Urban Worm Bag? How Long Until I Can Begin Harvesting Worm Castings? If you start from scratch, it should be about 4-6 months before you should expect to harvest worm castings from the bottom of your worm bag. You can reduce this time (and better ensure a happy home for your worms) if you start with an existing amount of vermicompost as a starter material. How Do I Maintain Proper Moisture in My Urban Worm Bag? This will depend on the ambient humidity wherever it is you keep your bin, whether or not you keep it indoors, and whether or not you keep it in your basement. The Urban Worm Bag breathes so well that it can tend to dry out too quickly if left neglected. In any case, if you grab a handful of vermicompost and squeeze it, you should be able to squeeze out a drop or two of moisture, much like a well-wrung out sponge. If it’s too wet, add some dry bedding and stop feeding for a few days. If it’s too dry, use a spray bottle or spritzer as needed to maintain appropriate moisture levels. What If My Urban Worm Bag Has A Foul Smell? A properly maintained worm bin should not smell bad. More than likely, the bin is over fed, too wet, or both. Because the Urban Worm Bag has such good airflow, it is likely your bin has been overfed and the food is decomposing faster than the worms can consume it. Remove any excess food, add bedding, and monitor conditions. How Much Vermicompost or Worm Castings Can the Urban Worm Bag Produce? Your results are dependent upon too many variables to give you a good number. However you can use commonly-known rules of thumb to get a very rough estimate. Conservatively, worms can eat 25-50% of their own weight per day and at maximum density, you will have around 2 lbs of worms per square foot. The Urban Worm Bag has roughly 4 square feet of surface area. So an Urban Worm Bag stocked with 4lbs of worms will be able to process roughly 1-2 lbs of food waste per day under good conditions, roughly 50-70% of which will exit the worm in the form of worm castings. How Many Worms Should I Purchase for My Urban Worm Bag? At full capacity under optimal conditions, the Urban Worm Bag could conceivable hold 8 lbs of worms. But we recommend no more than a 1-2 lbs of worms to start with. The worms will multiply quickly and the population will eventually grow to the capacity that your conditions allow. My Urban Worm Bag Is Dripping. What’s Going On? Your Bag has been overfed or overwatered. A properly-maintained Urban Worm Bag, or any worm bin for that matter, should not be draining an excess of water, also known as leachate. How Can I Use My Worm Castings? This is up to you! But most people prefer to use worm castings and a soil amendment at a 10% substitution rate or apply it directly to the base of their plants as a top dressing. Note: This will not burn the plants. You can also brew worm tea by mixing water and a compost tea bag of worm castings at roughly a 1% concentration and apply as a soil drench or a foliage spray using a handheld low-pressure sprayer. This is an incredibly economical way to use worm castings. Can I Use the Urban Worm Bag Outside? Technically, yes, but the worms won’t be able to tolerate extreme hot or cold temperatures and should be protected from direct exposure to sunlight and precipitation. It is highly recommended that the bin be kept indoors. NOTE: The Urban Worm Bag’s frame MUST be kept on a level surface. Won’t the Zipper Get Stuck? I often receive questions about the zipper and whether it will bind under the weight of the vermicompost or be difficult to close. The zipper is marine-grade, nylon coil with over-sized teeth to accommodate the grit and dirt you will encounter at harvest time. During testing, the zipper was subject to frequent openings and closings under intentionally dirty conditions. In all situations, I was able to simply back the zipper in the opposite direction before successfully reattempting opening or closure of the zipper. To clean the teeth, I also used a toothbrush or small wirebrush to clean the bristles, which made operation even easier. UPDATE: After several customer requests, Version 2 of the Urban Worm Bag features an interior drawstring enclosure, which will better protect the zipper from dirt and excess moisture. Won’t the Castings Just Fall Out? vermicomposting systems can feature a mesh bottom that is two inches long by one inch wide, but yet the vermicompost does not fall through the mesh. Due to both bridging and the tapered design of the Bag, the weight of all of the vermicompost will not be resting on the zipper in the Urban Worm Bag. Can I Get the Owner’s Manual? Absolutely! Click the image below! Can I Use the Bag As Part of a Commercial Operation? The short answer is “yes,” but the Urban Worm Bag is designed more for home use. You could use several Urban Worm Bags to create “small batch”-style castings with different feedstocks to create different vermicompost (ie, fungal-dominant rather than bacterial), but a mid- to large-scale operation should be considering an industrial-level continuous flow-through system like the kind offered at Michigan SoilWorks. How Is the Urban Worm Bag Different Than the Worm Inn Mega?? The Urban Worm Bag is certainly similar to a product called the Worm Inn Mega, but it differs in several significant ways. The Urban Worm Bag is slightly larger than the Worm Inn Mega as measured by available surface area, which is the key metric for vermicomposting. It is 8 inches shallower than the Worm Inn Mega to allow for a quicker vermicomposting cycle when the Bag is at max capacity. Its fabric is a 900D Oxford fabric with a polyurethane coating that is slightly less breathable to reduce excessive evaporation and reduce the likelihood of having dry, lifeless castings at harvest. The top of the Urban Worm Bag is made from the same material as the rest of the Bag, to reduce evaporation and maintain dark conditions. The Worm Inn is built with a mesh top similar to mosquito netting. 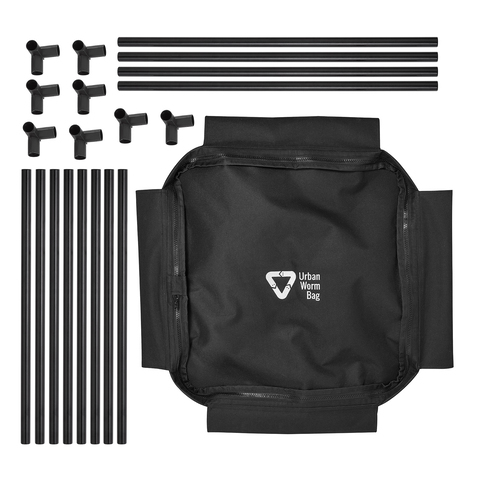 The bottom of the Urban Worm Bag features a zipper to allow for a more controlled castings release and reduce or eliminate the risk of leakage. 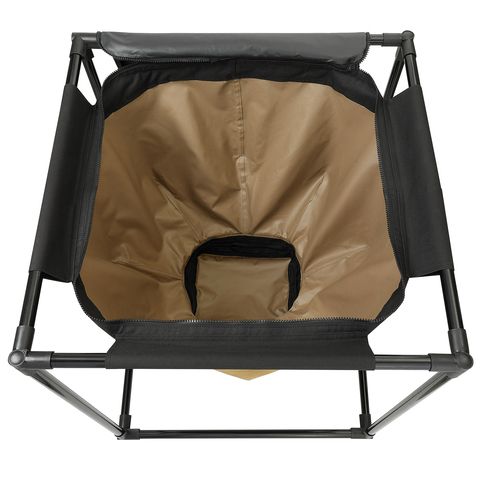 The Worm Inn features a drawstring bottom that can be prone to leaking, especially during the initial setup of the bin. The lightweight iron frame is included. The Worm Inn assumes you will either build or buy your own frame. Free shipping is offered within the United States. Why Doesn’t the Urban Worm Bag Have a Tap for Leachate Like the Worm Factory 360? A properly maintained worm bin should not be producing leachate and adding a tap to the product would suggest that it should. Leachate is often anaerobic and/or pathogenic and presents a risk to your plants if you choose to treat them with it. The Urban Worm Bag’s depth and breathable fabric construction reduces the likelihood of conditions that would result in leachate. What Are Those Little Fabric Loops On the Bottom of the Urban Worm Bag? Because the Urban Worm Bag is suspended from an iron frame, I thought it would be handy to have something to pull against to prevent the Bag from swaying.